This personalized stocking is the perfect way to include your favorite pet in the holiday festivities this year! Customize it with your pet’s name and fill it with all of his favorite treats. The traditional plush red Christmas stocking with a personalized name embroidered at the top has taken a new spin! Our furry friends are often more like family – with their own beds, bowls, even apparel! When your dog or cat is viewed more as a child or sibling than “just an animal” you want to treat them to special things, just like you would the rest of your family! The holidays are a special time for the entire family, so of course you want to include Fido or Princess in the festivities. Include your special buddy in the festivities with a personalized pet stocking hung by the chimney with care, In hopes that St. Nicholas soon would be there! 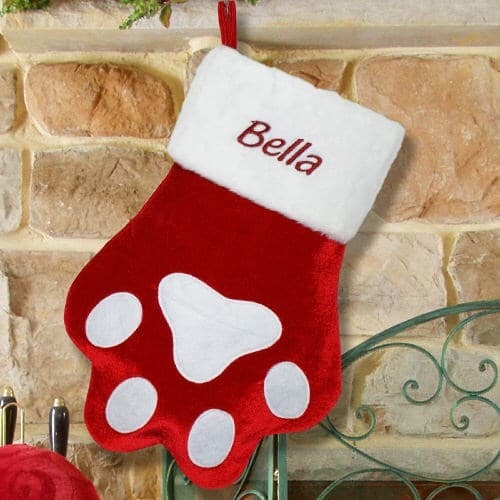 This special personalized stocking is great for your pet because not only because of it’s unique paw shape designed to evoke your pet’s foot (and how it’s different from a standard, human shaped foot stocking! ), but it’s also embroidered with any name you choose, just like the traditional personalized stockings for the rest of the family. This customized Christmas stocking for pets is 15″ long x 7.5″ wide at the top by the cuff and 11″ at the widest point at the bottom of the paw. This gives you ample room to fill it to the brim with treats, toys and goodies that your extra-loved pet wants and deserves for being a very good boy or girl. Order your entire family their own personalized Christmas stockings this year, and be sure to include the four-legged family members with this clever and cute pet stocking.